Michael Bay loves his filming tech, using each of the TF films to experiment with something new. Transformers 4 is continues the tradition as he has added Radiant Image's Nevo line to his lineup for the film (in addition to new IMAX 3D cameras). 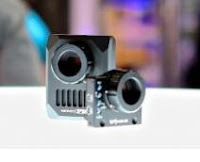 The web-cam sized cameras were shown to the public for the first time at Cine Gear Expo this weekend. The cameras shoot in uncompressed 2k Raw. As for what 2k Raw means I don't have a clue but I think it comes down to the video will be detailed enough that only experts might be able to tell the difference between what was shot by the mini-sized cameras vs. their larger counterparts. What it comes down to is their tiny size but professional quality recording means that Bay can get really creative on his camera angles and stick em pretty much anywhere he wants to shoot a scene. I just hope this doesn't result in TF4 resulting in shaky-cam syndrome that plagues many an action flick. Thanks to Wynton R. for the link. RAW means it's not compressed. So a lot of informations, but a rather short duration of video can be shot at once with those cameras. And also, the lense is slightly "fish-eyes". first person point of veiw?